Get ready to get stuck into the weekend a little early by kicking off on a Thursday with a little music for the mind and soul! Starting off with punk/garage outfit “The One Twos”, you’ll be shaken and stirred about the state of the world, before “Intellectuals” agitate you with their combination of wit and angular politics. 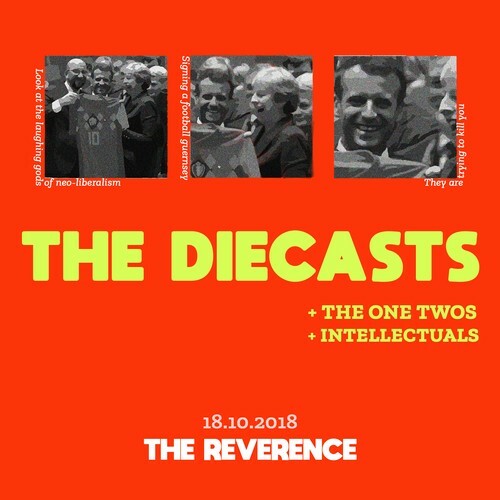 Finally, jump aboard the musical rollercoaster that is “The Diecasts” as they trawl through their various influences from punk to jazz, to rockabilly and country! You’ll be sent on your way with a big ol’ smile on your dial, out the door by 11:00pm, ready to take on the world the next day. Alternatively, sneak in a few extra quiet ones ‘til midnight close; if, you know, you really wanna start the weekend early!